Winter Vacation is coming up and if you have tyrannical offspring under the age of twelve you know that means countless whining sessions of “I’m bored” and even “come and play with me”, “color/draw with me”, “cut and paste with me” in general just “do something with me!” And you probably won’t have time to stop and take a breath with all the cleaning and cooking the holiday season brings. That and the stress of trying to be super woman and not breaking a sweat in front of the in-laws or your other “competitive company” i.e. the women with the perfect manicures, well-behaved children, spotless picture perfect homes and designer clothes who serve up gourmet delicacies they cook themselves. We should actually be thankful for their questionable existence, if it weren’t for them how many of us would actually try to workout once in a while and change out of those baggy plaid PJs? A trip to the dollar shop can turn up some real treasures, yes and also cheap “use today, break tomorrow, dump in recycling on Wednesday” items imported from China. So you have to be careful. If you go in the aisle that has all that artsy stuff you will be amazed how many things you can find that will actually keep your kids busy for at least fifteen and if you are lucky sometimes a little longer. 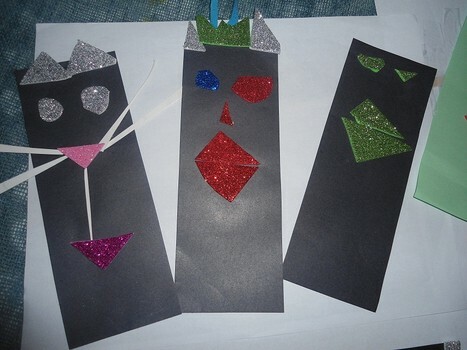 Cutout pieces of colored paper, glittery fomic sheets in bright shades, sequins, beads, glitter glue, pom-poms and feathers are great for making cards, murals and other holiday themed decorations. Kids love decorating boxes and empty jars that you can use to give gifts in or candy in. You can make an outline of Santa, candy canes, reindeer or whatever else and have them decorate it as they like or even use old coloring book pages if you aren’t that great at drawing. If you have older kids threaten to take away their Xbox controller or with hold shopping money till they draw an outline of a big fat snowman on a sheet of chart paper for their siblings. Twin 1 and 2 made these, all this stuff came from the dollar shop. Empty jars and odd left over pieces from tea sets or serving sets can be made into very pretty center pieces for the coffee table. You could also get stuff from the Thrift store. The pine cones, dried flowers and shiny little pebbles that you find in boxes under the kids’ beds are great to use for these. 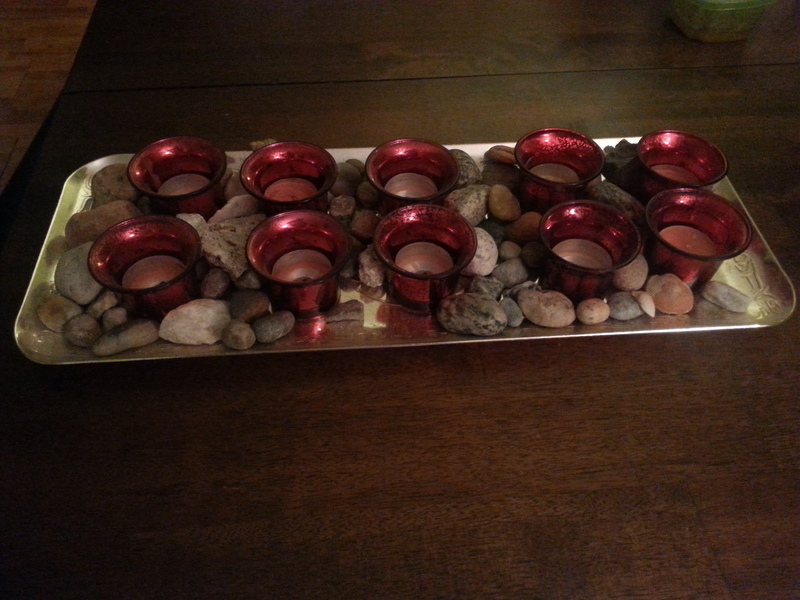 You can even find elegant (and cheap) glass candle holders to use at the dollar shop. Don’t forget to bake some extra cookies to use as a bribe to get them all to clean up their mess. And if that doesn’t work then you can always remind them of the gifts they won’t be getting, that often helps in convincing them to cooperate.